Ned Parker has retired and is no longer a constable in Center Springs, Texas. The area speedsters take advantage of this and start drag racing past his farm, but many of the other folks in the community don't seem to realize that "retired" means they can't call him over every little concern they may have. All he wants to do is be a cotton farmer and do what he can to make sure his grandchildren, Top and Pepper, are fully recovered from the events of the past summer. But it's just not meant to be. If there's trouble, folks pick up the phone and call Ned. One such call sends him to the banks of the Red River where a body has been found, and then he finds himself in the middle of a manhunt. The new constable, Ned's nephew Cody Parker, and legendary Deputy John Washington are searching for a killer in the long-abandoned Cotton Exchange-- a building that they rapidly find is packed full of the town's garbage and riddled with tunnels and booby traps. There's only one way to get the killer: to crawl through those tunnels and avoid those deadly traps. And there's only one person qualified for the job: Vietnam veteran and former tunnel rat Constable Cody Parker. Cody's got to crawl in there, catch a killer, and make it back out alive. I think it's best to begin my comments with a warning. If you are extremely claustrophobic, you might want to give Burrows a pass. I am, and I almost didn't make it out of the Cotton Exchange with my sanity intact. Now I can hear what you're thinking. If I'm so claustrophobic, why did I keep reading the book? Was someone holding a gun to my head? Well... no. No gun to this head. But the reason why I couldn't stop reading is because Reavis Wortham is a powerful storyteller whose words can grab you by the throat and not let go. From the chilling opening scene, I could no more stop reading than I could stop breathing. Once again there's more to Wortham's Red River mysteries than murder and mayhem. These two books are a pitch-perfect evocation of a time. In 1964, I was a couple of years younger than Ned Parker's grandson Top, but I also played "Combat" and rode my bicycle around town and country getting into things I knew I shouldn't be getting into. If Scotty were to beam me to Center Springs, Texas in 1964, I'd feel at home, and no one would have to tell me to be careful with the gossip who listens in on the party line. Although Top and Pepper don't have the big roles they did in The Rock Hole, Wortham lets us see how they're dealing with what happened to them in the first book. Both children are having problems, and Ned deals with Top's acting out just like my mother and grandfather would have dealt with me. (There are many benefits to living in a small town.) Do you have to read The Rock Hole to make sense of Burrows? No, you don't, but you're probably going to finish this one and then get your hands on that first book as fast as you can. There's a running joke throughout this book in which people are constantly telling Ned Parker, "I thought you was retired!" It reminded me of "Big Jake," a John Wayne film in which everyone thought Wayne's character was dead. "Not hardly," said the Duke, and when he finally got tired of it, he said, "I'm going to shoot the next person who says that!" I was hoping that Ned Parker didn't run out of patience like John Wayne did. The anxious men beside the radios chuckled nervously and continued to watch the building. They were frightened by the entire horrific night, the Ghost Man, a demented murderer who had already taken one man's life, and a frightening building that was possibly digesting two friends at that very moment. If there's one author I'm glad I discovered in 2014, it's Reavis Z. Wortham. The man certainly knows how to write the kind of story that makes you realize reading it is much more important than a good night's sleep. Cathy - That's the thing about a really talented storyteller, isn't it? You can get through even difficult scenes because you're caught up in the story. Glad you enjoyed this one. I read The Rock Hole after your review and liked it very much. 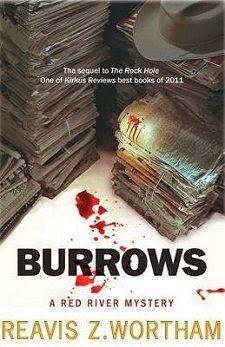 I am reading Burrows soon. I just finished The Rock Hole after reading your review. I'm 122 pages into Burrows and I'm just in love with this series.